Digital Penetrometer Description: SE-Test India Pvt. Ltd. is known as the most trustworthy manufacturers and suppliers for providing the lab testing instruments to critical sectors such as civil, electronics, oil, petroleum, and industrial engineering. Se-Test India’s Digital penetrometer (model no. SET-1303) conforms to the IS 310, 1203, 1448, IP 60, 49, 50 ASTM D5, 217, D637, BS 2000-49 industry standards. Digital penetrometer helps to determine the consistency of the sample bituminous under pre-specified conditions or factors of time, temperature, and load. The penetration results are expressed in the distance of 10th of millimeters that is vertically penetrated by the standard needle. 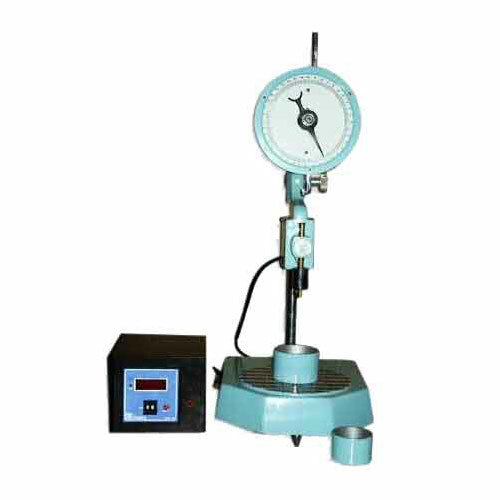 We manufacture the best digital penetrometer in a rugged environment and come with base table clubbed with leveling screw. On the base, a vertical pillar mounted with leveling screws. The head along with dial plunger rod a cone slides on the pillar and can be easily clamped to the desired height. It also carries the digital timer for controlling the penetration duration. For fine adjustment of needle or cone tip to sample comes with a rack and pinion and pointer assemble. A clutch mechanism is incorporated which help to read the penetration and subsequently help in resetting a simple and accurate operation. The dial is graduated in 400 1/10 and the millimeter subdivisions with the needle pointer against the actual figures for easy reading. Comes with a bitumen penetration needle, two sample containers, and ring weight one every 50 gms. and 100 gms, lead screw gear arrangement, Spirit level, and a digital preset timer.